From 9 am to 5 pm, the Brewery Shop on North Brink will be offering free tastings of Elgood’s Award-Winning beers, including a selection of their innovative new fruit-flavoured, Belgian-style Wheat Beers. Visitors will be able to buy beers to take home on the day and to order beers for the Festive Season. 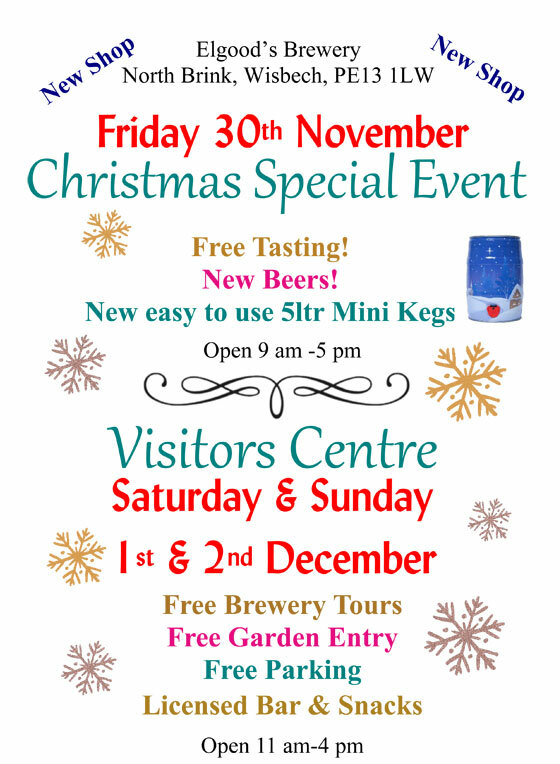 Over the weekend, the Brewery Visitor Centre will be open for their annual Christmas Special Weekend. Doors open at 11 am on both days. During the two days, visitors can take a tour of the brewery, explore the beautiful gardens, sample Elgood’s award-winning ales and order beer for the festive season. Parking, entry to the Visitor Centre and the Brewery Tours are all FREE! The Brewery Shop will be offering the full range of Elgood’s bottled beers for sale as well as a selection of attractive gifts. Light refreshments will be available from the licensed café-bar. As in previous years, there will also be a range of stalls offering locally made gifts and crafts for that more unusual Christmas present. Tickets will be on sale for a raffle to be drawn on the Sunday afternoon. Proceeds will be added to the on-going fund-raising on behalf of Norfolk Hospice Tapping House and a presentation will be made on the day. For those who can’t make it to either of these events, the Brewery Shop situated in the North Brink Offices is open 9 am to 5 pm Monday to Friday and there is an on-line shop offering home-delivery.